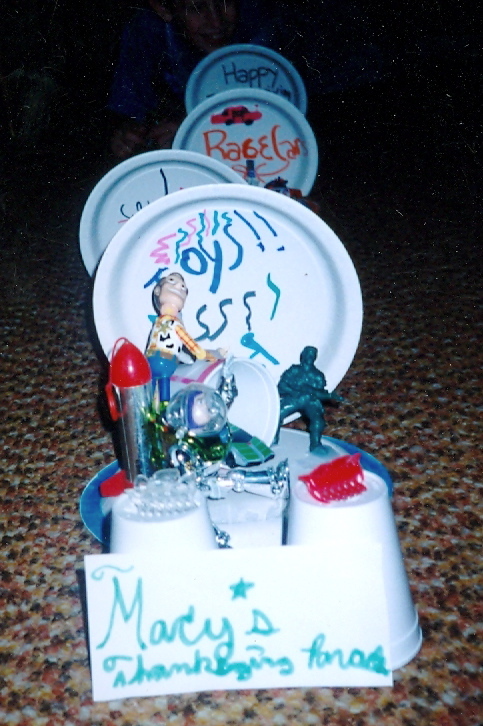 The floats from the Macy's Thanksgiving Day Parade were fun to design for my daughter and her brother on a long ago Thanksgiving. 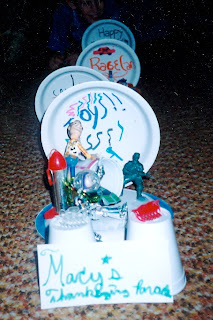 A few of their prized possessions plus paper plates, markers, disposable cups, lots of tape and glue, and a scissors is all that was required. You could construct the street from construction paper or a fabric runner. You could include a Thanksgiving Turkey. From there you can become as creative as you wish. I think Santa Claus should be added to the end for a little excitement. Despite the fact that it is not very sturdy, repairs are a snap with tape! It's a cool table decoration for Thanksgiving. A few helium balloons or a Pilgrim or two would really set it off well. Better get busy, Thanksgiving is next week!